The classic combination of bacon, lettuce and tomato is also known as a BLT – a really popular and tasty mix. Most often served in rolls and sandwiches, Shape My Plan here present a healthier option with the BLT in a Bowl. Westpark Fitness are glad to partner with the Shape My Plan app to offer our members access to hundreds of recipes in tandem with a nutritional tracker, tips and information for only €4 per month instead of the usual price of €12 per month! Using a grill, cook the bacon rashers to your liking. Up to five minutes on each side will suffice – but again, once they are cooked and to your liking (crispy or not etc.) they are ready for you. While the bacon rashers are cooking; slice the handful of lettuce, cherry tomatoes, the scallion and the avocado and mix them together in a bowl with the sliced cucumber. You will see that this is a colourful and healthy combination that is tasty too! When the bacon rashers have finished cooking, dab them on both sides with a paper towel to remove any excess grease. Next, cut them into chunks and at this stage you may wish to trim away any of the fat (but this is optional and to taste). Mix the chunks of bacon rasher into the bowl with the other ingredients – and your BLT in a bowl is complete and ready to eat! 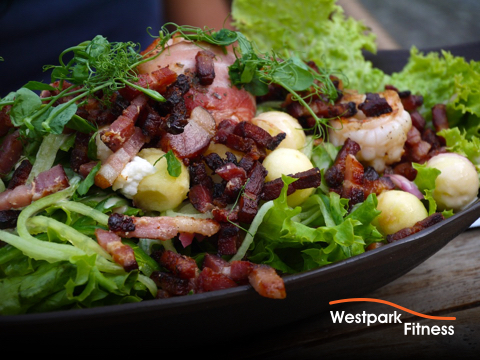 Tasty, nutritious and beautifully balanced, the BLT in a bowl is a great way to healthily satisfy your appetite and ideal to refuel after a visit to Westpark Fitness! Not a member of Westpark Fitness yet? Click / Tap here to book a free tour of our facilities.